I know you’re not going to say that, but your child will! Besides the quirky events on the fairgrounds and the Mythbusters show, this is perhaps a quieter, more regular way to spend Saturday morning with your child. These classes take place at the Stevens Nature Center at Hemlock Bluffs Nature Preserve in Cary. An age-appropriate book, an ‘investigative stroll’ and finally a crafts project all related to the topic. This Saturday, you and your little one (age 3-5) will learn about the cute little raccoons that inhabit our parks, streets and backyards. PRE-REGISTRATION REQUIRED! If you’re planning to go, you should sign up as soon as possible this afternoon (course code 56377). If you haven’t used the somewhat cumbersome sign -up system, well, good luck. (The first time is complicated, but after that it quite easy to do online.) As of this writing, spots were still available. 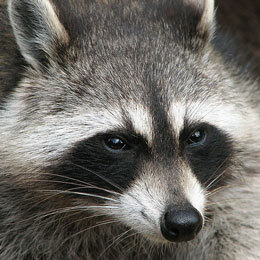 The picture is Raccoon (Procyon lotor) 2 by Darkone used under the CC-BY-SA license and found on the Wikimedia Commons. This entry was posted in Animals, Outdoors by daddyweekly. Bookmark the permalink.